I’m not thinking in terms of number of patent filings, amount of venture funding, or angel investors by square foot (or meter), but on many other metrics, Yaoundé, Cameroon far outpaces the more obvious entrepreneurial hubs of London, Tel Aviv, Singapore, and Silicon Valley. Everyone here is an entrepreneur. That spirit is palpable. From papaya sellers, to cell phone credit merchants, to self-proclaimed podiatrists selling shoes, the streets of Cameroun’s capital are swarmed with people dealing in every product you can imagine. The diversity of enterprises is impressive. You’ll find jeans, q-tips, phones, tomatoes, ties, boiled peanuts, soccer cleats, and grilled corn all on one block. And every seller is somehow creating value. From purchasing ginger in bulk to sell individually to preparing and grilling fish (a delicious meal but with obvious risks for delicate expats), these entrepreneurs are doing everything they can to provide for their families. 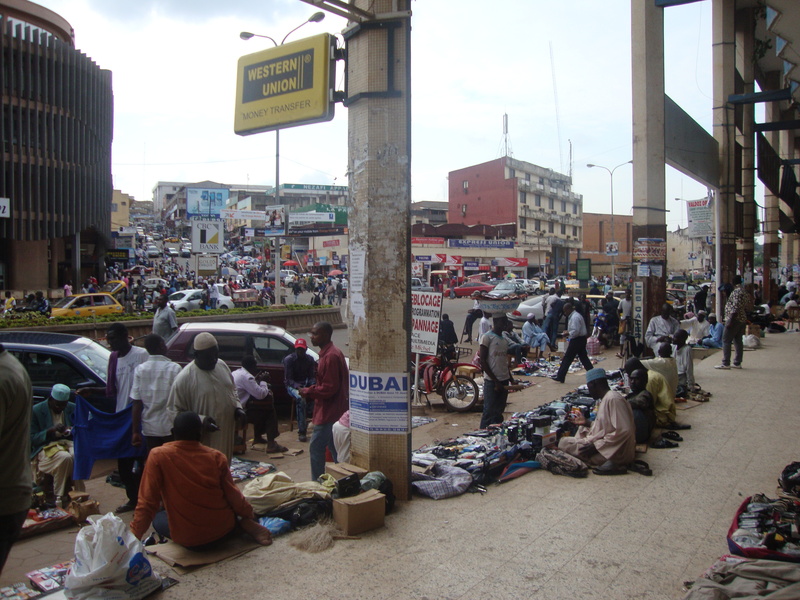 It’s in busy streets like these that microfinance still has tremendous potential. It’s been said, countless times, that one of the most rewarding experiences for us Kiva Fellows (as you might imagine) is meeting borrowers- those inspirational men and women who work hard, every day, to make a better life for themselves and their families. To know this satisfaction is something I certainly expected before my placement here in Cameroon. 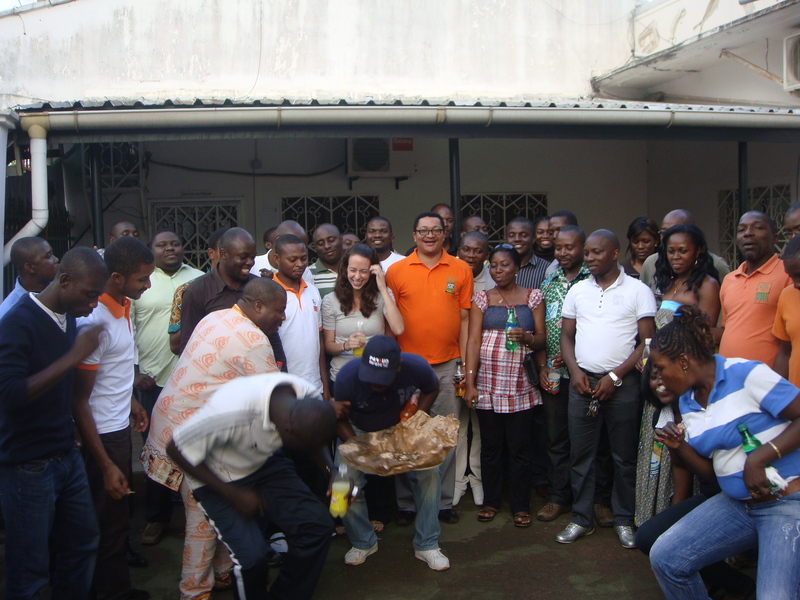 One thing I didn’t expect, however, was the pleasure and understanding I would gain from getting to know the staff of ACEP Cameroun– the partner MFI with whom I’ve been working these past four months. 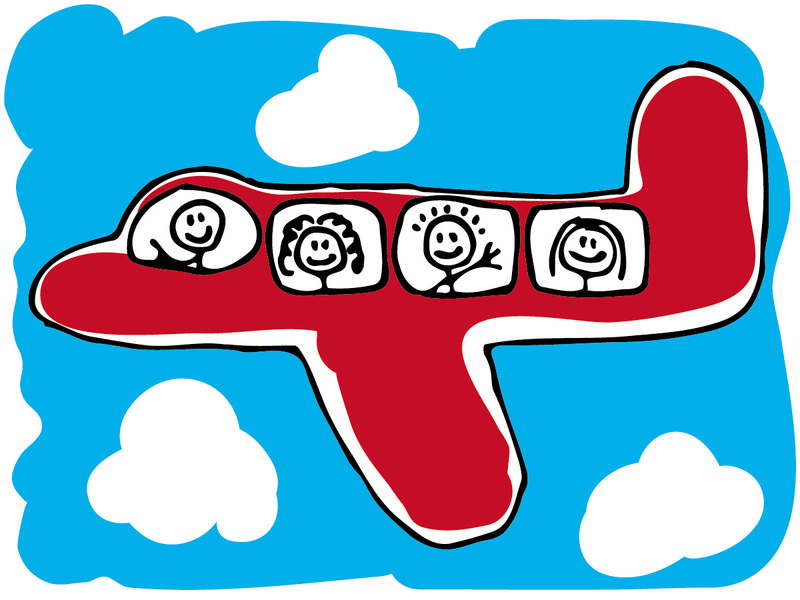 As I say my final goodbyes and prepare to pass the proverbial torch to the next Fellow working with ACEP, it’s pretty much impossible not to reflect on the good times that we’ve shared together, both in and outside of the office. From walking in the very first day, nervous and unsure, to watching ACEP’s inaugural borrowers go live on the Kiva website, to receiving their initial repayments- it’s been a journey of both intense work and intense…. celebrating! We’ve all had these moments: Trying to impress a native speaker with our ability to speak their language, we compose an elegant sentence in our minds, open our mouths, and… proceed to swallow our feet whole. Indeed, we Kiva Fellows have had no shortage of these moments – we’ve twisted and tortured whole phrases so that they come out no better suited than to embarrass and offend. 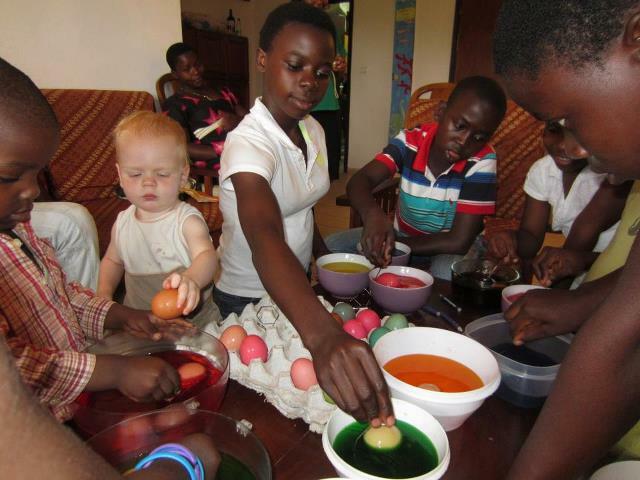 What do you get when you combine service learning, microfinance and the enthusiasm of youth? Well, at the American School of Yaoundé (ASOY), you’d have yourself a pretty innovative and well-organized microcredit program… and the 12th grade Global Issues class of Mrs. Kelly Vaughan Owens has done just that. 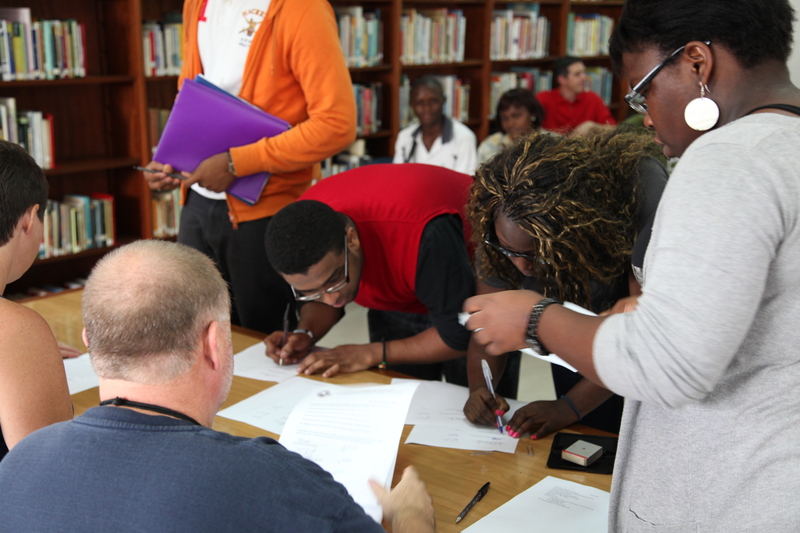 AMFO class participants and administrators sign loan disbursements. This week has been one of many firsts here at ACEP Cameroun. Not only has the MFI’s partner page officially gone live, but the bank’s inaugural Kiva borrower, Nathalie, has just received her loan. I watched with pride as ACEP’s Kiva Coordinator reviewed with Nathalie her disbursement paperwork and then walked her over to the cashier’s station. It’s a sensation I’d liken to how one must feel when sending a son or daughter off to the first day of school- a mixture of joy, reassurance and perhaps just the tiniest bit of apprehension as to what lies ahead. 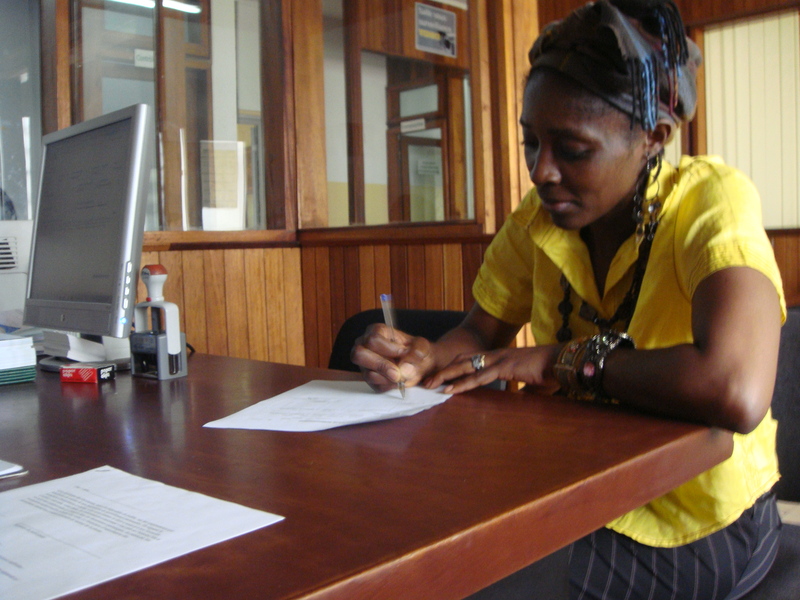 ACEP's first Kiva borrower, signing her disbursement paperwork.